Dr. Nathan Graber of St. Peter’s Pediatrics, a practice of St. Peter’s Health Partners Medical Associates, appeared on WNYT’s Forum 13 to discuss JUULing, a form of vaping. The products are used to inhale liquid nicotine, and are becoming increasingly popular, especially among teens. Dr. Graber discusses the allure of these products, and the health risks associated with them. 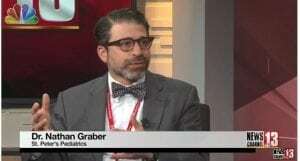 Click HERE to watch Dr. Graber’s interview.